FIGAP 2018 will be a globally noteworthy event, featuring participation by the most important exhibitors in areas such as feed machinery manufacturing, agricultural and livestock equipment, animal health, genetics, nutrition, livestock software, feed and seed bins and pet food, as well as aquaculture companies, ingredient and additive distributors, transport service providers and others. Solve your production challenges ! Find out how SCE can help you to optimise your production. 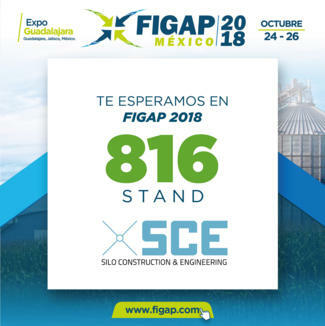 SCE is @ booth 816 at Expo Guadalajara, Guadalajara Jalisco, Mexico.